Diocese of Rochester | Our Nativity mobiles are in the Cathedral until 24 January 2017! Our Nativity mobiles are in the Cathedral until 24 January 2017! We often hear the question ‘Do people today really understand what Christmas is really about?’ If you visit Rochester Cathedral before 24 January 2017, you will find out that the children in our Church schools all around the Diocese know exactly what Christmas is all about. With a simple plastic hoop, schools from every part of the Diocese have created a set of twelve Nativity mobiles to hang in the Cathedral to remind us all what is most important about Christmas. For the past 3 years, we have worked in partnership with the Cathedral to capture the thoughts and imagination of our school children, some as young as 4. Each school writes about what inspired their work of art and visitors to the Cathedral can read about this during their visit. The Cathedral stewards report that this is received very positively over the Advent, Christmas and Epiphany period. 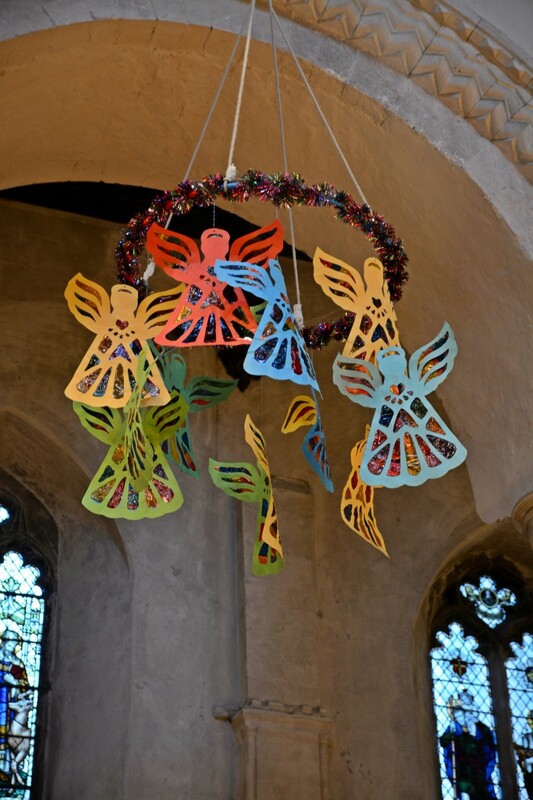 This simple way of producing something striking and meaningful and designed by children and young people works well in your local church – the idea came from my own parish church with hoop mobiles produced by our local school: one from each class , each with a different focus, to cover the Nativity story as a whole. Here is a flavour of some of the offerings for 2017. At Wateringbury CE primary school, ‘All the children in the school produced a painted hand print. The hands have been printed in lots of bright colours to show how colourful our world is. The hands have then been joined together to create a loving embrace around the world to show our love and peace to all in the world’. The reception and key stage 1 children from Fawkham chose to make angels to remember the special message that they brought to the shepherds and to make stars to remember that the star guided the Magi to find Jesus. At St Paul’s Cray, pupils explained that, ‘The large, silver star, which represents the star of Bethlehem, was created by using silver foiled paper, giving it a bold collage effect. The smaller, coloured stars, were created by using sharpie pens and acetate and glued together to create the 3D finish. The darkness of the night is shown by the black silhouette camels and wise men who are guided only by the single, brightly lit star’. If you get the opportunity to see the Nativity display in the Cathedral and read about how the children have thought about Christmas, remember how much children can continue to teach us. If we think on this, it should come as no surprise to us that Jesus came to us as a tiny child to teach us everything that we need to know.